I want to read it all over again! 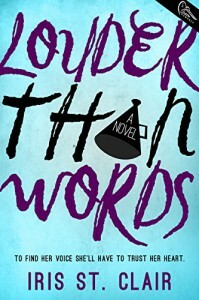 There are many reasons why I love Louder Than Words, which by the way is the perfect title for this book. Ellen, the main character, is my favorite kind of heroine with humor and wit and courage. She's insecure with herself as she's very young, but she handles herself well. With what she's been through with losing her dad and basically her mom, too, personally I'd want to curl up in a ball forever. But Ellen keeps going on. Rex was definitely charming, and in a genuine way. I enjoyed Ellen and Rex's witty banter the most. Every time their dialogue made me smile or even laugh out loud, I couldn't help but think of how much I was loving this book and these characters. They spilled their darkest secrets to one another within a day of meeting and were able to connect through the family problems they were facing. Ellen and Rex also frustrated me on many levels. If only Ellen could have seen in the beginning that Rex had an interest in her and might not be a bad guy after all! But I can understand why she reacted in the ways she did due to her issues with trust, especially after her teacher crossed the line and violated her trust. Some of Rex's actions had me scratching my head and cringing - I so badly wanted to tell him that's NOT how you win over a girl! I wasn't sure how Louder Than Words was going to end, which was a happy surprise. I thought it might end predictably, but for me it didn't. I could read this book again and again for the witty dialogue and for Ellen and Rex's interactions. I loved reading about them and want to do it all over again!